Buckingham Covers worked officially with Cunard to create this beautiful, limited edition cover. 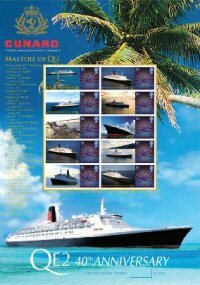 It celebrates the 40th Anniversary of Cunard's best loved cruise ship: QE2. 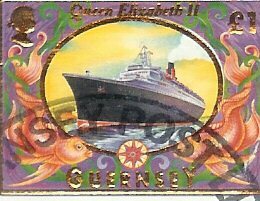 Each cover was carried on board the QE2's anniversary cruise and stamped with a carried cachet. 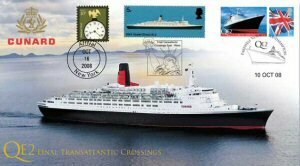 This stunning limited edition is the first ever Buckingham stamp sheet for a great Ocean Liner. 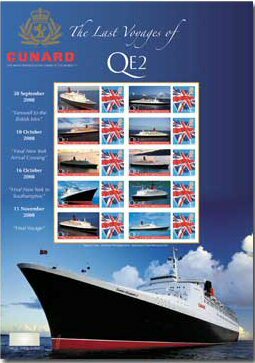 The sheet celebrates the 40th Anniversary of Cunard's great ship, Queen Elizabeth Two (QE2). This stamp sheet marks the 40th Anniversary of the QE2. A limited number are available carried on Cunard's famous ship. Plus, signed personally by Commodore Warwick, QE2's Captain for 9 years. 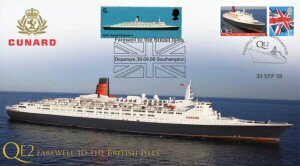 The QE2 is very busy, especially with 30 atlantic crossings a year. 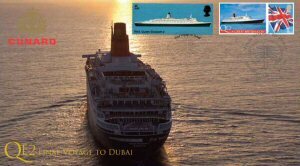 Now, the QE2 is leaving her travels behind her and moving to warmer waters, as a floating hotel in Dubai. Illustrates the magnificent QE2 and will be carried on her final Atlantic voyage from Southampton to New York. The great ocean liner, Queen Elizabeth 2 is setting off on her last voyage around the British Isles. QE2 has been the flagship of the Cunard fleet for over 30 years. She made her maiden voyage in 1969 and is one of the last great Transatlantic liners. With a capacity of over 2000 people and a host of facilities, every journey is luxury. 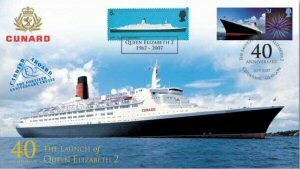 After nearly 40 years in service the great ocean liner, Queen Elizabeth 2 is being giving a well deserved rest. She will be moving on to pastures new and retiring in Dubai, to become a floating hotel. This is the final cover in the 'Last Voyages' collection, marking QE2's last journey and arrival in Dubai for the next stage in her successful career. The cover features and stunning image of the QE2 and will be postmarked on 11th November 2008, when she leaves Southampton for the last time.